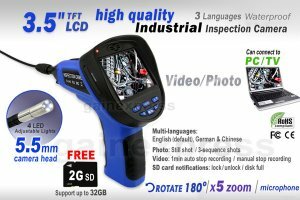 This 3.5" TFT LCD Industrial Endoscope (Visual Inspection Device) comes with a much smaller & thinner 5.5mm camera head. It allows to investigate into a smaller & slimmer hard-to-reach area to help in diagnosing broken part, weld point and other work that would otherwise not easily accessible for direct inspection. The LCD screen can be rotated by 180° to adjust the angle of observation with increased visibility up to 5x magnification capacity making the process more visible, convenient and easy. Main features includes voice recording via built-in Mic, 720x480dpi still photo & Video D1 (AVI movie file output) and screen display resolution of 320 x 240 pixel. It also has an SD card Slot that supports up to 32GB and selectable NTSC & PAL format. The standard 1m Flexible & removable tube have a waterproof level IP67 camera head with optimized Focal Length of 6cm, you can inspect area under water, gaps and holes effortlessly.